FTL|: Faster Than Light is a game about Star Trek-esque space battles and the exploration of dangerous, unknown sectors of space. It captures this schlocky sci-fi feeling of victory and disaster better than any other game I’ve played – you’ll be facing total chaos, you’ll panic, and then within seconds you’ll be rerouting energy from the engines to the ship’s shields, dodging missiles, and unleashing a volley of laser fire at your foe. It’s not just a game of victory and disaster – it’s a game where victory can be joyful and disaster is so often absolute. As the commander of a small ship, you’re charged with an urgent mission to deliver information about rebel forces to your commanding fleet. Each ship (only one is available at first, but you can unlock different ones throughout the game) is a naze of interconnected rooms, some containing systems, like Shields, Weapons, and Engines, that are vital to your survival. On your journey you’ll use faster than light (FTL) travel to jump from one star system to another, choosing which to visit and which to bypass. This will generally trigger some event, which could be anything from battle-ready rebel ships to friendly aliens looking to help you out on your journey. And while combat is the meat of the game, you’ll never know quite what you’ve gotten yourself into when your ship jumps into that new system. It’s a nerve-wracking experience, because not only is the rebel fleet forever on your heels, but make too many mistakes, take one too many hits to your ship’s hull, and you’ll lose everything. And if you die it’s game over, forcing you to restart from the very beginning. Later fights can get extremely difficult as well, so death is a constant, menacing threat. This wouldn’t mean anything if combat was dull and shaky, but fortunately the mechanics of combat are simple, elegant, and tightly designed. And despite their individual simplicity, these mechanics come together to create a relatively complex affair with the option for many different approaches to battles. You’ll have access to a limited selection of lasers, beam weapons, and shield-bypassing missiles, each of which functions differently. You can also buy other systems that allow for different approaches: a teleportation room lets you send boarding parties onto enemy ships, drone control systems allow you to field autonomous offensive or defensive robots, and stealth systems allow you to periodically become invisible to enemy sensors. These options depend in large part on how you’ve outfitted your ship, and you can use salvaged scrap to upgrade shipboard systems (stronger shields, engines that are better at dodging enemy fire, etc.) so long as you also upgrade your reactors enough to keep them all powered. You can also use scrap to purchase new crew members, weapons, systems, and more from the shops you find scattered throughout open space. It all allows for a lot of variety in combat, but there are a disappointing number of limitations as well. For example, despite the complexity on show most fights will tend to follow similar patterns, especially near the beginning of the game – hit the enemy shields with everything you have, take out their weapons system (leaving them unable to fire back until they’re fixed), and then continue to pummel their helpless ship until it’s destroyed. Eventually you’ll earn enough scrap to unlock new options through the purchase of new weapons and systems, but the enemy AI rarely responds by changing its tactics in any significant way. This lack of variety affects other aspects of the game, as well. 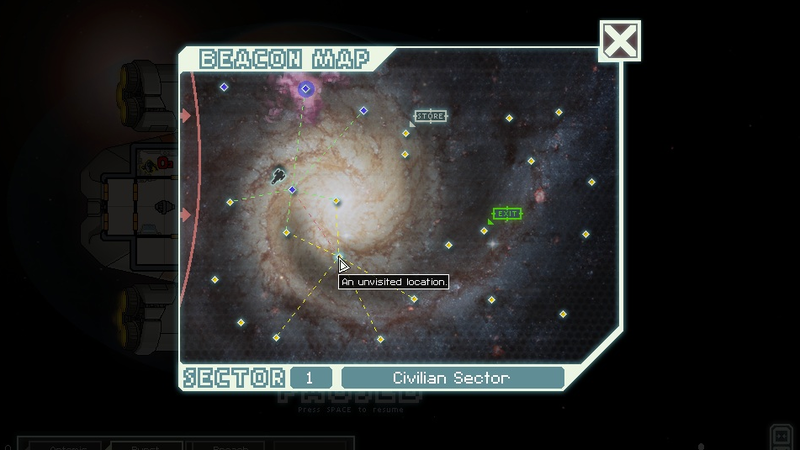 Occasionally you’ll encounter ‘Choose Your Own Adventure’-style scenarios when you jump to a new system. Here you’ll be given multiple possible choices as to how to approach the situation you find yourself in – for instance, you may encounter a nearby colony plagued with disease, and be given the option of either attempting to help them or avoiding the risk and leaving them to their fate. But while these situations are nice additions to the game, you’ll simply run out of them within a few hours. On your second or third playthrough (a full, successful playthrough lasting just over an hour) you’ll start to feel like you’ve seen everything there is to see, and considering this is a game that’s supposed to be replayed over and over that’s just not good enough. Part of the problem is that the game’s trying to do something really awkward here – it’s trying to be a (partly) narrative-drive roguelike, and while I’m not going to say that’s an impossible thing to do well it just doesn’t work here. The game tries to overcome the lack of variety through its heavy emphasis on randomisation. Each playthrough of the game is different in many ways – you’ll travel through differently structured sectors of space, you’ll encounter different enemies, you’ll find different equipment available at shops, and so on. But this never really does a great job of making things more unique. It’s like the game is randomly dealing you a hand from a deck of playing cards – while each hand is different, after a few deals you’ll no longer ever really be surprised by any given configuration of the same old cards. And this focus on randomisation introduces its own problems. First, and perhaps most importantly, there’s the issue of unlocking new ships. A playthough of the game with the standard human ship will feel very different from one using one of the alien ships – in fact, this is one of the best ways the game makes things feel unique again. But you unlock these ships by meeting certain unexplained, somewhat arbitrary conditions, and because of the random nature of the game you could play the game through many times without being able to discover these conditions, let along meet them. There are also other little problems introduced by randomisation – you might die forty minutes into a game through no fault of your own because you simply failed to find any good weapons to use against your increasingly powerful foe. And sometimes FTL jumps that appear routine will be labelled by the game as impossible, forcing you to backtrack directly into the path of the rebel fleet (again, often leading to death). I had a difficult time with FTL, then. My first few hours were absolutely joyful – I was encountering all these interesting ideas interacting with one another and forming clever, satisfying combat. And the game was doing a great job, as it still does hours later, of telling different poignant little stories about this doomed ship flying through space (stories that are told through what the game throws at you and how you respond to this). But after a time I stopped seeing new things, the game started to repeat itself, and even the combat started to run out of steam. Every so often there was something new and exciting (the first time you unlock the stealth cruiser, the first time you wipe out an entire enemy crew without destroying the ship, the first time you disable an enemy’s shields and watch as they get torn apart by an asteroid field) , but this happens less and less as time goes on. There’s simply not enough variety in its systems to support the kind of emergent, unique play of something like Minecraft or DayZ. And as a result, though it may still want you to play it over and over again, it stops giving you any compelling reason to do so. That’s a real shame, because, while I’ve been very critical here, it does do something really special. Despite the issues I’ve raised the mechanics surrounding combat and upgrades still manage to be compelling hours later, and, as I said above, the game wonderfully captures the feeling of flying through space with power to shields and weapons hot. I’m really hoping that a substantial expansion to FTL gets announced sometime soon, because that’s exactly what the game needs. An injection of new content and new systems, like The Binding of Isaac’s substantial Wrath of the Lamb expansion, could turn this interesting but ultimately limited game into the full-bodied, emergent experience it’s trying to be. 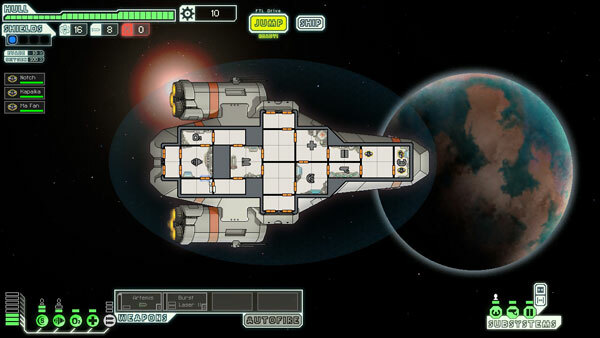 This entry was posted in Games Blather and tagged FTL: Faster Than Light, Review, Subset Games. Bookmark the permalink.